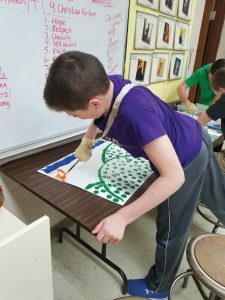 The first art unit of third quarter for the eighth-graders at Assumption Catholic School in Durand is called “Visual Invitations for Human Civility.” In this class, students are introduced to the nine basic human needs, ranging from safety to empathy; supported by nine Christian virtues that are themed each month of the school year. Additionally, students are guided by the book Joni by Joni Earekson-Tada. Joni, after a diving accident in 1967, was left a quadriplegic without the use of her hands. Out of this serious physical limitation, she found opportunity for breaking through her limitations by teaching herself how to paint with a thin paintbrush in her mouth. Joni’s story is a wonderful example of how basic human needs can change at any time, and that our own physical lives can be changed at any time through mishaps, accidents, illness or natural aging. For the class, the eighth-graders experimented with imposed limitations. Some used slings or bound their fists, while others attempted to use their less dominant hand or restricted their vision through the use of only one eye to alter their visual depth perception. A few attempted to paint using only their mouth or toes. Students were then asked to think about their experience attempting to paint with these sudden adjustments, if it was uncomfortable, how long it took to adjust and the progress they made painting with these uncommon approaches. Many felt the need for patience, empathy and kindness by others while they were adjusting to their new approaches to painting. During this class, I noticed that no one passed judgment on anyone. Students were helping each other, working side by side, and everyone was accepted as humans with needs, with the dignity God intends for us. 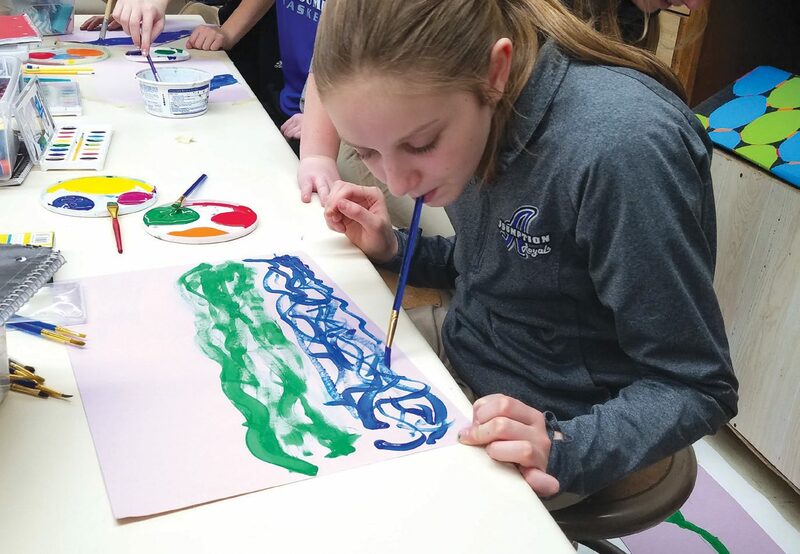 The goal of this interactive art class was to raise awareness that, through creativity, physical limitations can result in limitless beauty, as these eighth-graders demonstrated by their openness and grace. Using our Christian virtues, we have faith to believe that everything is in God’s hands, and that His will for our basic human needs is always an opportunity for us to grow in faith and in personal pursuits, with no fear of further limitations.